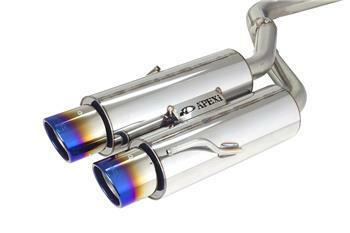 APEXi Exhaust - N1-X Evolution Extreme - Dezod Motorsports Inc - Home of the automotive performance enthusiast since 2002. The N1 Evolution Extreme is based on the RS Evolution Muffler with the addition of full titanium tips. A Hybrid muffler uniting the power and free-flowing characteristics of our N1 Muffler with the quiet and discreet sound output of our Hybrid Megaphone Evolution Muffler. The N1 Evolution Extreme is a combination of an A’PEXi original patented megaphone piping structure design and larger piping diameters to produce ultimate performance for your turbo-charged engine.